I haven’t done as awesome with my daily toddler play goal as I’d wanted to, but we have gotten to do some pretty cool stuff. 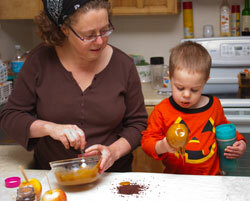 Since it seems like our most successful toddler play efforts (at least, the really cool memorable ones) involve the kitchen, I decided to make caramel apples with Norton. After all, we still had some goodies left over from the cookie decorating kit, so why not? 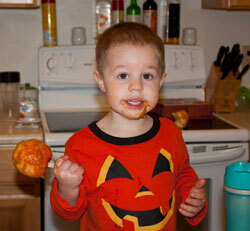 It turns out that making caramel apples is a lot easier than I thought. All you need is caramel, popsicle sticks, apples, and milk. That’s it. Anything else is gravy. That’s it. Put the caramels and milk in a microwave safe bowl and microwave for around 90 seconds, stirring half way. Then dip your apples and you’re on the way! To make clean up easier, we spread wax paper over the counter. 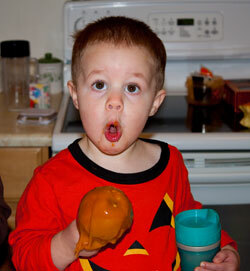 Granted, I did most of the dipping since Norton was more interested in the eating, but we had a ton of fun! Wow, is that easy! Also looks like fun for the little ones. I love Caramel Apples. How fun and yummy! I would love to make these with my son! What a great idea! Thanks for the recipe! It looks like you both had alot of fun, and the apples look yummy..